Starr Commonwealth’s Hannah Neil Center in Columbus will celebrate the opening of MyPlace, a pioneering new independent living program designed to help promising teens overcome their past and successfully complete their transition into responsible adulthood. This building at 1625 E. Mound St. in Columbus will house youth in the MyPlace program who are learning to live independently while transitioning to responsible adulthood. MyPlace students, ages 16 to 18, will live on their own in one of 16 furnished apartments in a building on the east side of the city. The program is operated by Starr Commonwealth, a national children and family services organization with locations in Ohio and Michigan. 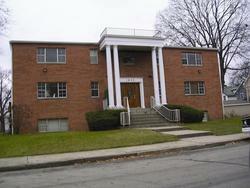 The MyPlace apartments are located at 1625 E. Mound St. in Columbus. Residents of the program must attend school, work, or both to remain in the program. “The program is for youth who are highly motivated and have a great deal of focus,” said Chuck Jackson, Vice President of Community and Alternative Programs and Director of Starr Detroit, where a similar successful Starr program has provided valuable insight on how to structure the Columbus program. After nearly a year of planning, opening day is finally here. “There are many, many community partners who have helped us get here,” said Jackson, adding that Starr would like to invite them and everyone in the community to join Starr leaders, local officials and others for a ribbon cutting ceremony, light refreshments and a building tour from 10 a.m. to noon May 9. “MyPlace is everyone’s place – when we support youth, it benefits the whole community,” said Martin Mitchell, President and CEO of Starr Commonwealth. Founded in 1913, Starr Commonwealth is a nonprofit organization that serves children and families from locations in Albion, Battle Creek and Detroit, Michigan, and Van Wert and Columbus, Ohio. Services range from foster care to residential treatment and in-home counseling programs that help young adults learn to live independently. Starr also offers No Disposable Kids, a multi-faceted training program that helps schools identify their strengths, analyze their weaknesses and utilize practical, prevention-oriented tools for creating safe and productive school environments. For more information about MyPlace or the grand opening celebration event, call 614-491-5784. For more information on Starr Commonwealth, visit http://www.starr.org or call 800-837-5591. Members of the media who would like to attend should confirm with Dana Jacob by Wednesday, May 7 by calling 800-629-5591 ext. 2312.